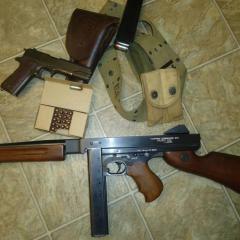 MAC 10 .45 acp $7000 + SHIP/INS, i pay 1st stamp, MAC Powder Springs / RPB IND. marked Transition, Exc.cond. , S/N C782, w/modified AK front grip (easyl removed by removing ‘O ‘clamp) , Very Controllable, w/ 3 mags ., brass catcher and mag loader, (w/ 1 new barrel, 1 Used barrel, not shown).